Some of the photographers really know how to shoot jewellery to make it look its best. Whether it is focussing on its intricate detailing, or having it laid out on a beautiful backdrop. Choose your frame right for getting the perfect shot. There is something magical about sneak peeks of brides. The first look, the first reveal is everything. Make sure you get this shot at your wedding. This is a good way to show off the jewellery as well as the intricacy of your bridal lehenga. The glitter shimmer of the jewellery and the dress go perfectly in sync with each other. No bridal look is complete without that drop dead gorgeous bridal earring. There are multiple ways of shooting the earring. But the most common of the ways is to pose while putting the earring on. My favourite from the lot. This one just makes you want to see more. It’s a great teaser of what’s coming next in the photo series. Whether you’re putting the nath, the earring or the engagement ring on, a bonus is you can show off your bridal makeup with it. Hard to pick a favourite from these right? Once you’re ready and all decked up, take a shot next to the window. It gives the impression that you’re all set to get married to the love of your life. Forever is just around the corner. The quintessential bridal portrait pose. One with the dupatta, one without and you will have completed your entire set of bridal portrait shoots. If you are a fan of black and whites, you can choose any of the bridal shoot pictures and have black and white photos added. They look timeless, and are great to see even after years have gone by. 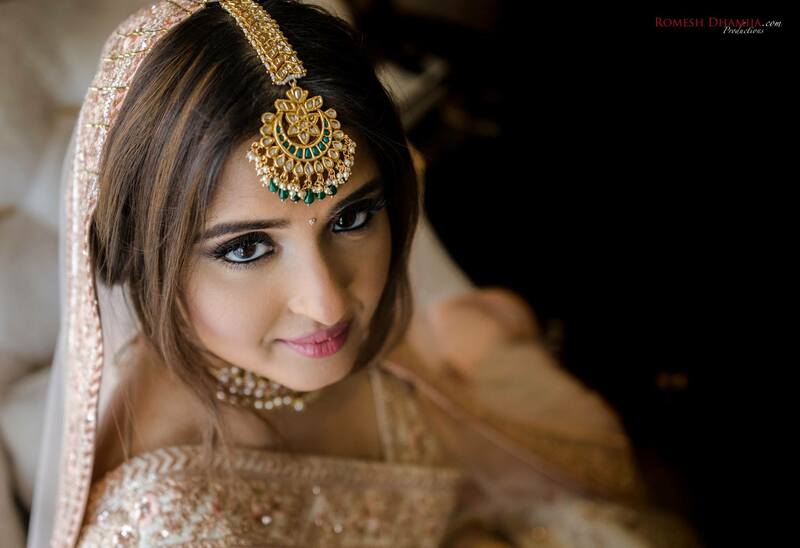 Most of the brides nowadays opt for kundans and jadau jewellery over traditional gold jewellery. It looks royal and you should make full use fo showing it off on your d-day. Maang tikkas are the latest trend since the past few years. Off late, there are so many stores making some stunning maang tikkas. No reason why you shouldn’t click them right? These are some of the standard must click pictures that you cannot and shouldn’t miss. Putting on the bangles, wearing the dupatta, trying on the nath they all make for stunning images later on. # Show off that engagement ring. Pretty simple, isn’t it?